The International Telecommunication Union or ITU defined Internet of Things(IoT) as "A global infrastructure for the information society, enabling advanced services by interconnecting (physical and virtual) things based on existing and evolving interoperable information and communication technologies." The IoT have changed the ways HVAC&R being monitored, analyzed and controlled in ways that were never dreamed of a decade ago. Energy efficiency, comfort, remote monitoring, remote control and ease of maintenance are some of the advantages as a result of using the power of the internet. A conventional standalone ductless split PCB control. We will take an example of ductless split units that have been growing rapidly due to their simplicity of installation and affordability. The typical standalone or limited networked controls are confined to the particular unit or the local network within the building. The standalone units are usually cost sensitive products where the controls are done using wireless handset or wired controlled thermostats. Newer units may have built-in sensors that help to detect the presence of occupants. This data is used to set the temperature, fan speed, compressor speed and direction of air flow of the unit to save energy as well as providing comfort to the users. In buildings that require all the air conditioners to be networked for central monitoring and control purposes, a proprietary or standard communication protocol are used to network all of the equipment together. 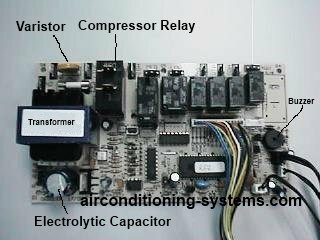 Usually a separate communication module or a special control board is required to be used on each unit for networking purpose. These controls are not connected to the outside world and an integrated master control panel may be used to control the air conditioners, lighting, fire alarm and security systems from a central location. The IoT have made use of the advancement in information and communications technologies where the flow of information in a secure environment have enabled them to change the ways HVAC&R are being controlled. Here are some of the advantages of using Internet of Things in heating, ventilation, air conditioning and refrigeration. These devices in the equipment are not only connected to each other but are also connected to the outside world through internet connectivity. This means that as long as there is an internet connection with enough bandwidth anywhere in the world, you will be able to access each equipment not only to see how it is doing but also to control it remotely and in real time. The analysis of data gathered from the equipment coupled with other prevailing data such as the weather forecast, holidays of the year and number of occupants will enable the system to make better decision. This will ensure optimum settings are being used to achieve the highest operating efficiency. The settings of the system will be able to change continuously without any assistance from the users if possible. This is a simple artificial intelligence at work. Better efficiency will translate to savings in electricity hence lower operating bills. Typical savings can range from 20% or more compared to the conventional system. See the video of how Daikin uses Internet of Things in their products. With internet connectivity, the system can use cloud computing to do all the necessary computation and storage in a secure environment. Information can also be downloaded easily from the cloud as and when needed. You can now download the apps that have been developed using Apple or Android operating system. Monitoring, control and alerts using tablets and smart phones are now possible. Even if you are thousands of miles away from your home, you can still control and monitor the cooling or heating systems through the internet. See some of the Smart Thermostats that are utilizing this technology. Each piece of equipment will have an address and in the event that a unit fails, the system will be able to detect the particular unit that has failed. The type of faults can also be easily incorporated into the system to save the time needed to diagnose and solve the problem. Maintenance work will now be faster. There are many non-profit organisations which have incorporated protocols that enable IoT to be used with their systems. By joining these organisations, you will be able to cut short your development time and join the communities of companies with products that are certified to be used in that particular environment. Check out the suitability of LonWorks, Modbus, Zigbee, KNX or BacNet in your product development effort.